When Billy was playing hockey in Germany, he would get two breaks during the season that we could take a short vacation. Our first winter in Cologne was a really cold, bone chilling winter; maybe I found it so cold because I was coming from Florida? For the February break I just needed to go where there was sun, but I didn’t want to spend a whole day travelling to get there. In Europe the southern tip of Spain is the most southern point, so that’s where we went, Marbella in particular! Southern Spain is called the Costa del Sol, because it has so much sunshine. It took us a few days to get used to the schedule there. Everything closes down for the afternoon Siesta and people eat dinner late! Billy and I would be skulking outside restaurant doors, and as soon as the door opened we would pounce to get a table for dinner. There really was no need for the pouncing, as we were the only ones there when the restaurant opened. The waiters definitely thought we were nutso! After a couple of days the silly North Americans got used to “Spanish Time”. You know what’s so great about eating dinner later? Tapas! Tapas are small plates of food that are eaten just to hold one over until that late dinner. Our favorite tapas were Serrano Ham (kinda like prosciutto), Queso viejo (often aged Manchego cheese), olives and tortillas. A tortilla in Spain is an omelet with potatoes that is served at room temperature; and it’s just called “tortilla”. I titled the recipe “Spanish Tortilla”, just so that you wouldn’t think this was a recipe for burritos. The next time we went to Spain, we went to Barcelona, which is such a romantic city (Sigh, I miss travelling); we got with the program right away. Billy and I have decided that the Spanish/Spaniards (I don't know which is correct or politically correct or politically incorrect, it's all so confusing now a days) have got it right. Nap in the afternoon, tapas in the early evening, and dinner later at night! Why can’t we do that at home? Sometimes, if we’ve had a late lunch, Billy and I will have our favorite tapas as our dinner, and reminisce about the good old days. Start with a large russet potato that has already been baked; I don't normally like baked potatoes done in the microwave, but these will be sautéed so microwaving will be fine. I don't peel my potatoes because the skin is loaded with nutrients, but if it the skin bothers you, remove it and then give the potatoes a dice, make 'em nice and big. Sauté the potatoes and onions in about a tablespoon of olive oil, over medium-high heat; season with salt, pepper and Herbs de Provence (or Italian seasoning). When the potatoes are browned and the onions are soft; turn the heat down to medium and add a tablespoon of butter to the skillet. Add the beaten eggs to the pan and gently stir the eggs. When the eggs are about halfway cooked, distribute the ingredients evenly in the skillet, stop stirring and put a lid or a sheet pan over the top of the skillet. Cook for 3 to 5 minutes, until the eggs are set. If you like you may slide the tortilla onto a cutting board or a platter and slice it into wedges. While the potatoes were cooking I started making the Cheese Bread and got it into the oven, so that it would be done at the same time as the tortilla. Start by spreading a couple of tablespoons of butter on the bread. You can see that I did not have any soft butter, so I just cut really thin slices off the stick and laid it on the bread; in the end it all goes down the same way! I had aged Gouda and Pecorino Romano cheeses in my fridge so that's what I used, use whatever you have! Sprinkle the cheese on the top in an even layer. Bake in a pre-heated 425 degree oven for 10 to 12 minutes; just until the cheese is melted. Allow the bread to cool for just a few moments before slicing it so that the cheese doesn't slide off on you. Traditionally Spanish Tortilla is served room temperature, as tapas maybe with some Serrano ham, aged Manchego cheese and olives. I also serve it warm, as lunch or light dinner with Cheese Bread and salad. 1. Heat the olive oil in a large non-stick skillet over medium-high heat. Add the diced potatoes and onions; season with Herbs de Provence (or Italian seasoning), salt and pepper. Sautee until the onions are soft and the potatoes are golden brown. 2. Turn the heat down to medium. Add a tablespoon of butter to the pan, allow it to melt and then add the beaten eggs. Stir the eggs around the pan gently with a spatula or wooden spoon. Cook while stirring the eggs until they’re about halfway done, be sure the ingredients are distributed evenly in the skillet; and then cover the pan with a lid or a sheet pan continue to cook until the eggs are set, 3 to 5 minutes. 3. 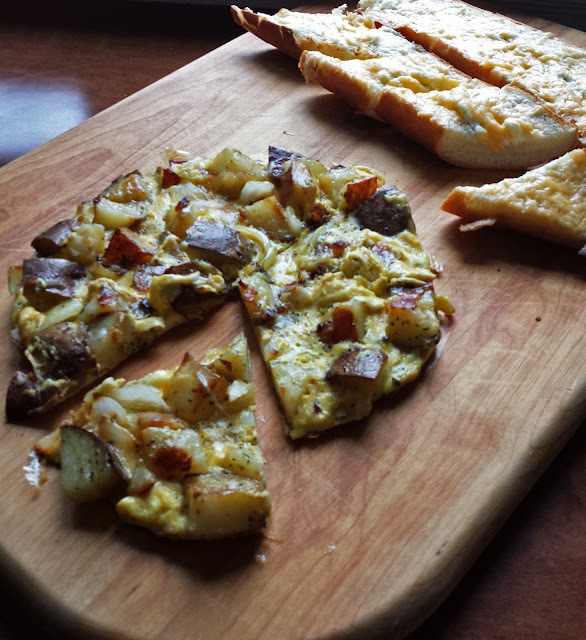 When the tortilla has cooked, you may slide it on to a cutting board or a platter and cut it into wedges. 2. Slice the bread in half lengthwise, lay the bread on a sheet pan cut side up. 3. Spread butter on the cut sides of the bread, and spread cream cheese over that. Sprinkle the cheese evenly over the top. 4. Bake in the hot oven for 10 to 12 minutes, until the cheese is completely melted. 5. Remove from the oven and wait just a few minutes to slice the bread into portions using a serrated knife. We eat a looooot of eggs in my house, and this would be the perfect breakfast to change things up! Looks fun and tasty, my dear! Oh yum!! You have inspired me just in time for lunch. For sure you have chosen one of the nicest places in Spain to escape Northern European winter Kari.